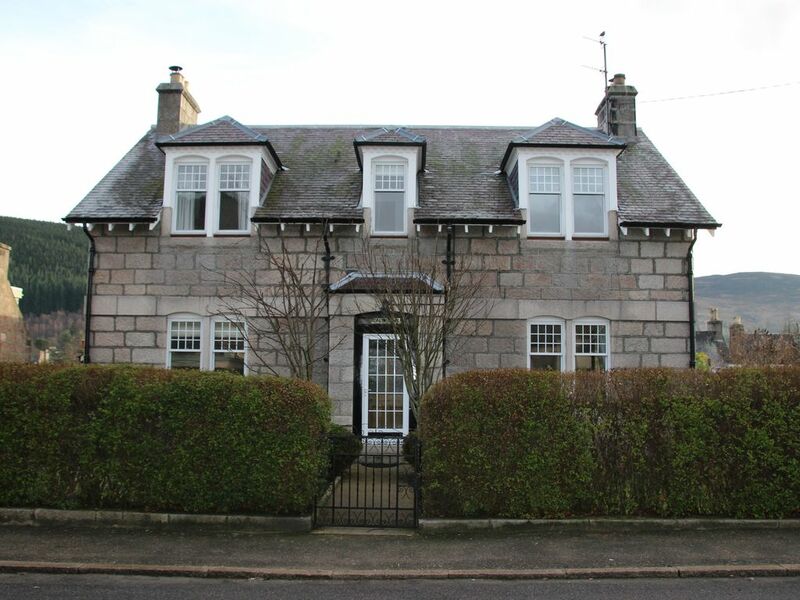 Rannagowan is a large detached period Victorian property situated on a quiet street, only a two minute walk from the centre of Ballater. The home has been refurbished to a very high specification and makes a great self-catering holiday let for families and large parties. On the ground floor is a large living room with an open fire, a separate dining room, fourth bedroom and a large newly installed kitchen diner. Upstairs is the master bedroom with en-suite bathroom, 2 further double bedrooms and family bathroom. There is a secure outhouse that can be used to store bicycles during your stay. The property is fully enclosed and has gates which can be closed for dog and child safety. The rear garden faces south and enjoys views of Craig Coilleach Hill. There is an outdoor seating and dining area to enjoy al fresco entertaining on sunny days. Ballater is known as the gateway to the Cairngorms National Park, and is set in magnificent scenery and easy reach of Balmoral, the Scottish holiday home of the Royal family. The village offers a range of local amenities including a variety of shops, award winning restaurants, hotels and cafes. The area in general is a haven for the outdoor enthusiast with a wide range of sporting activities. For the golfer Ballater has an 18-hole golf course with tennis courts and bowling green adjacent to the clubhouse. The area has excellent hillwalking, extensive on/off road cycling options and the ski centres at Glenshee and the Lecht are within easy reach. For the angler, the River Dee is one of the most popular salmon rivers in Scotland and there is an excellent trout fishery at Tullich. Clean and spacious with first class appliances. Lovely garden, near the shops but very quiet. There are many attractions in the area. Great for walking. A really great property, we loved it. Rannagowan is a lovely, comfortable house, with plenty of space. It has secure storage for bikes (at least 6 would fit), and a nice sized garden. The bathrooms / showers are excellent & the bedrooms are roomy and light. The kitchen is well appointed & a decent size. (Those who wish to cook may want to bring the following: scales, whisk, ladle, apron & spatulas for use with non-stick pots & pans). The house is really well located, within a minute’s walk of Co-op, restaurants & pubs. A wonderful home from home. Very friendly owners who gave me lots of advice re. local transport and walking routes. The accommodation is very modern and spacious with beautiful original features. An enclosed sunny garden compliments the house perfectly. Is within walking distance of all the local shops, restaurants and golf course. We have stayed in Ballater many times over the years, but this is definitely our favourite. A perfect 10 out of 10. We will be back! Our chageover day is Saturday.